A bigger hit with the critics than the Box Office, the quiet contemplation of Paterson was bound to divide purists and those seeking entertainment. The film is beautiful; full of poetry both written and visual, but not much ‘happens’ in the two hour running time. 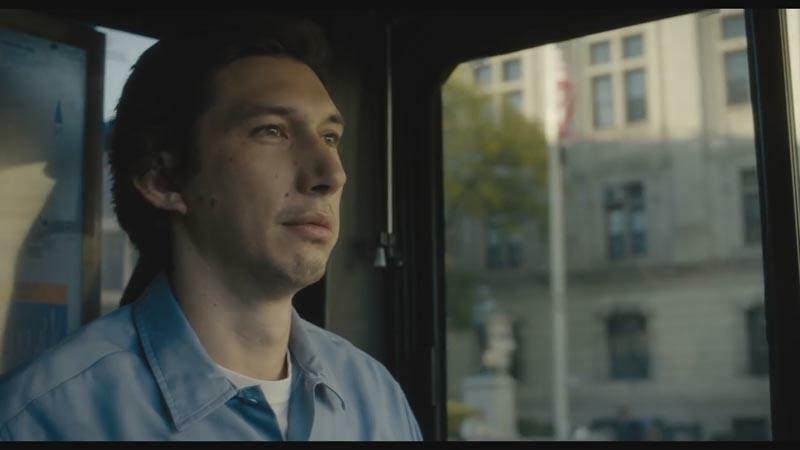 Adam Driver plays eponymous bus driver Paterson, who lives and works in Paterson, New Jersey. This sentence almost summarises the aesthetic Jarmusch is toying with. Like the poetry Paterson writes and is transcribed across the screen, it includes internal rhymes, touching romance and a gentle warm sense of humour. The structure of Paterson’s daily life is the substance of what we see. There are seven sections, one for each day of the week with gradual variation and increasing depth. The opening shot of each day is a bird’s eye view of Paterson and his beloved girlfriend, Laura. He checks the time and leaves to drive his bus, have lunch by a waterfall, walk the dog in the evening and have drink in his local bar. The seemingly mundane routine is punctuated by the series of poems he composes. Meanwhile, his girlfriend is comparatively unfocused; constantly repainting the house in black and white, determined to get rich via cupcakes and self-educate herself on the guitar. Driver plays a thoroughly nice introvert who follows in the footsteps of his poetic heroes by writing on the job. William Carlos Williams, a practicing doctor, is one of his favourites. Williams is a celebrated figure in Paterson (the place) alongside fellow resident Allen Ginsburg. The cultural heritage of Paterson is another whim of Paterson through the visitations of the protagonist to the local bar run by Doc (Barry Shabaka Henley) who is constructing a wall of fame of such alumni. Paterson’s own poetry is that of Ron Padgett and is read with great authenticity by Driver, it feels pieced together in real-time for the viewer. His reluctance to make a copy of his notebook or share his work makes for an interesting thought on the function of art. Does it need an audience? What is it if it isn’t shared? The dog Marvin (played by female Nellie) turns out to be an increasing antagonist for Paterson, who we find is seeking to undermine him. As primarily her pet, Marvin draws the attention of Laura and yet is Paterson’s job to walk. It is brilliantly trained though and very much feels like a third character in their house. Sadly, Nellie died shortly after the end of the shoot. The Home Entertainment extras include a Q&A with Adam Driver, lead by Tim Robey. It offers interesting insights into Driver’s preparation, relationship with Jarmusch and the actror’s own opinion on Paterson keeping his poems to himself – particularly on point as Driver does not watch the finished product to any of his movies. Paterson is excellent especially for the romantic or literary at heart. It doesn’t have mass appeal, but why should it.